It’s a rough job, being a fan of rail shooters. 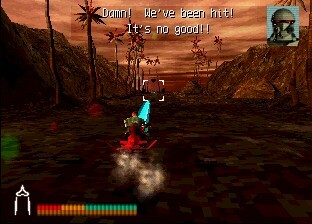 Panzer Dragoon had three good outings (not counting Azel of course, since it was an RPG), and Nintendo has repeatedly mishandled the Star Fox license, despite the fact that Star Fox 64 was not only one of the best examples of the genre, but one of the best on the N64. There are scattered other games for the PlayStation, like Virgin Interactive’s Gamera 2000, Polyphony Digital’s Omega Boost (a loose example, but we’ll allow it) and Asmik Ace’s Vanark (known in Japan, as well as on the American title screen, as Astro Trooper Vanark). 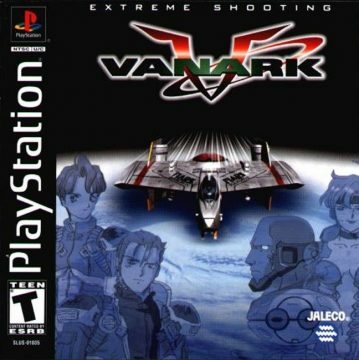 Vanark snuck quietly onto American shelves back in 2000, courtesy of Jaleco, one of those publishers that continued to exist despite publishing Punky Skunk and little else. 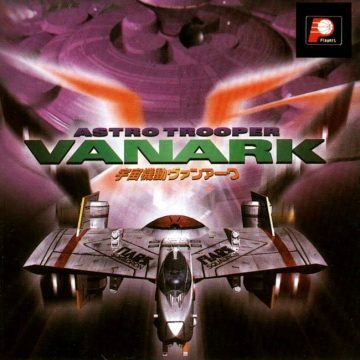 Vanark is your pretty typical rail shooter – fly a ship over 3D terrain, zoom through tunnels and past mountain, shoot bad guys with lasers or homing missiles. There’s a wingman which you choose before each level, which are rated on things like “Root Analysis” and “Combat Experience”, although it’s unclear to what any of that means. There are a number of different guns and lock-on weapons to choose from, all of which purport to different, but seem to be largely the same. Despite its no frills attitude, Vanark manages to be an engrossing experience simply because the flying and the shooting is so well done. Despite being a no-name title, it looks fantastic for a PlayStation title, and runs at a pretty solid frame rate to boot. Since you’re flying on a surface of an alien planet, you can expect to fly through jungles, over (and beneath) the ocean, into canyons and past ruined cities, and into the cores of the earth, flying over some damn impressive looking lava. 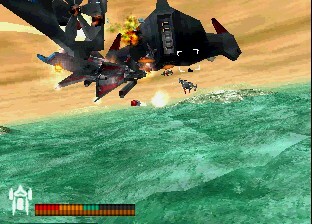 Similarly, the boss fights are pretty cool – the first stage has you squaring off against a gigantic robotic bee who shoots a huge laser out of its stinger. 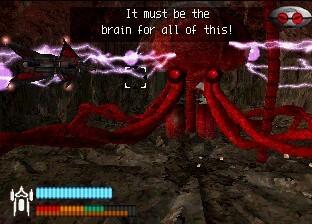 The fourth level boss is some kind of flying brain octopus that fires rotating rings of lightning. 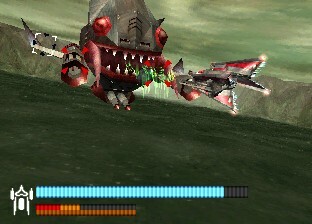 The first level miniboss and fifth level main boss both take a cue from the Darius games and has you fighting flying fish battleships. 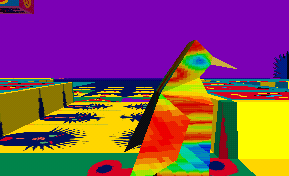 The first, second, fourth, and seventh levels are all straightforward flying levels. 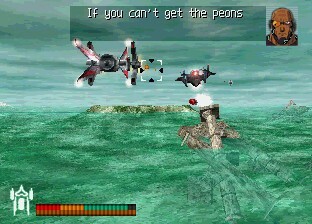 The third level takes place on a motorcycle, which like the tank levels in Star Fox 64, aren’t nearly as much fun. The fifth level mixes things up a bit by taking you off rails, sending you into the depths of outer space. Here, you must use your radar to track down and kill enemies, similar to the Colony Wars games. 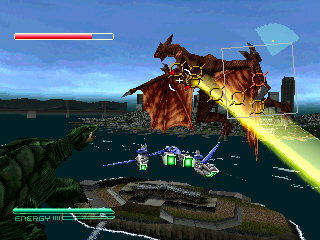 The sixth level is also free flying, although you just need to shoot down a boss. Surprisingly, these work a lot better than the arena stages in Star Fox 64, because they’re less confusing, and there’s no time limit involved in any of them. 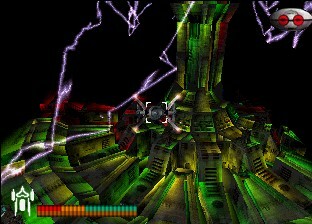 Despite the quality visuals (for the PlayStation, anyway), the level designs themselves are fairly dull, consisting mostly of flat landscapes with some scenery. It’s especially disappointing compared to the gorgeous vistas of the Panzer Dragoon games, but the enemies come on so quickly that it’s hard to be bothered too much. Technically the lack of variation in the stages does hurt the replay a bit, but a few of the stages have branching paths to liven things up. Your wingman will usually advise you of a path to take, which is usually the “easy” route, but you can ignore their advice and take the “hard” routes if you want a challenge. The game has three difficulty levels, but the action can get tough, and there aren’t any health regeneration items at all. The levels can get pretty long too. However, most stages have a handful of checkpoints, and you’re granted limited credits to restart when you die. You gain more credits as you get farther in the game, although if you run out, you can simply reload from your last save. So Vanark is pretty fantastic – for about two hours, and then it ends. Even though it’s well made, it doesn’t have the personality nor the depth of Star Fox, or the level designs of Panzer Dragoon, so it’s tough to replay. To make up for its length, the developers padded it out with a whole ton of hilariously unnecessary story sequences. 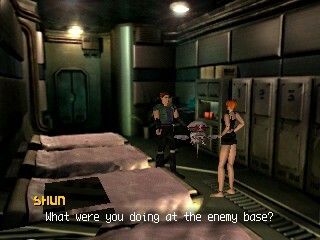 These aren’t just cutscenes between levels – after every stage, you get to run around your space station, Resident Evil-style, to talk to crew members and stuff. There’s literally almost no game here – there’s no puzzle solving or action at all, you just stumble around until you find the trigger, which begins the next mission. There’s one spot where you need to explore another ship under a time limit, which is pretty easy, and another mini-game where you need to guide a ball through a maze without touching the walls. If you fail, you end up damaging some of your weapons for the next stage. But otherwise, these are all extremely silly and tacked on. Vanark has the great aspirations to be an epic science fiction story too. There’s a CG-rendered intro, that someone somewhere paid money for – though probably not good money, given its quality. You’re a bunch of guys on a ship, who has to save Mars from biologically created monsters and destroy something called the Zero Field. You eventually save characters and add them to your crew, and there are poorly translated, overly dramatic text crawls after each stage detailing both your triumphant successes and harrowing dangers. However, other than the parts where you have to run from place to place, you can skip nearly all of the cutscenes, which makes this bloat forgivable. Vanark might not be the best the genre has to offer, but it’s still a pretty fun game while it lasts. It’s understandable that it was ignored when it came out – despite it quality, it was still hardly worth retail price, though it’s since climbed through the ranks to become one of the pricier domestic PS1 releases.